Marriage is hard. While it may be a storybook, it’s not a fairy tale. For anyone. We see images on social media of other couples and they make us paint comparisons. They make us feel like we are failing, whether in our relationships, in our parenting or in our careers. But, it’s just a front. Marriage is hard, parenting is hard, work is hard. Life is amazing but hard. Nobody posts the hard stuff, though. (Guilty as charged.) I think maybe we should post our imperfections every once in a good while; if anything to make light of the fact that we all go through things, and our social networks are not intended to be brag books but to be a way to connect and to share your life with people who you can’t see every day. My marriage isn’t perfect. My kids aren’t perfect. I don’t always succeed in these relationships. Maybe it looks like it is on social media. Like any couple we’ve been through our “stuff”. We’ve definitely hit rough patches, and we’ve both had our doubts. My husband and I have been married now for a little over eight years, and together for a total of something like fourteen-ish. We met in high school in a computer class. I was the programming idiot and he was the wiz who would help us pass the class and keep my nice GPA sparkling and untarnished. We lost touch for a while and later reconnected toward the end of our college careers. After dating for a little over four years we married in our mid-twenties, a time in our lives where we were merely thought we were grown ups. Eight years and two kids later, we’ve seen our “hard stuff” as a couple. And I’m sure we will see more along the way. But, what we finally woke up to and realized in year eight is that we had stopped talking somewhere along the way. We stopped really talking, like really talking the way we did when we first met. We would laugh a lot then. 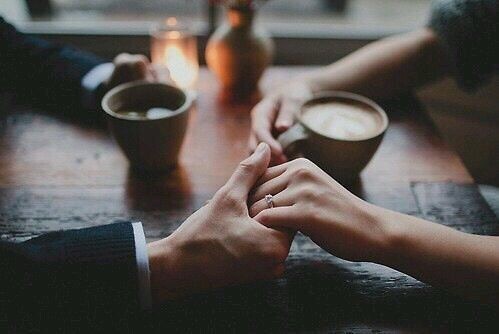 We would sit with coffee and talk about hard stuff, funny stuff, scary stuff. But, somehow over the years– with the stress of trying to grow up while married, and also feeling young and trying to find out who we really were as individual adults–we just had lost that ability to talk. Asking each other how your day was is not talking. Talking solely about the kids and what they ate for lunch is not talking. We started getting really honest. I mean, really honest. Like, the kind of honesty you fear for the first seven years because you’re afraid the other one is going to wise up to who they married. We started breaking down the walls between us. I’m opening up and sharing this because it is amazing how with this new full-on honesty approach, we have actually gotten mad at each other less. A lot less. We yell less even though the honest words seem like they would have the potential to hurt so much more. We hold grudges less. There’s something about breaking down the barriers and getting honest that can open up one’s eyes to the other party’s side of the story. I’m telling you this as a Taurus who truly perpetuates the sign of the stubborn bull. At times I’ve felt like I’m a lone-wolf in this world. I’ve felt like everyone else seems to have this marriage thing figured out so well, and this family thing rock solid. I’ve thought: maybe we just aren’t as perfect for each other as we thought on the day we said “I do”? But what I’ve come to realize is that if I’ve felt this way, maybe others have, too, and it’s just to taboo. Honesty has become taboo. Why? So I’m here to talk about it, to break down the social barriers. I’m here to tell you it’s okay to talk to each other with full on honesty. I’m here to share with you that marriage and relationships are hard. For anyone. There are all sorts of strains that touch us and dig their way into our relationships. Whether dealing with financial woes, the demands of kids, doubts, health challenges…you name it every marriage has its ups and downs. Sometimes the waves just seem to crash against the rocks harder and harder until you feel like you can’t do anything except to let everything wash up on shore and let the pieces separate and dissipate on their own. I’m not a marriage counselor. I’m not an expert on the topic. I’m just someone who’s learned through experience. Maybe, sometimes, we need first to let the rain pour and flood between the rocks, and then see what happens to the wave. Can it be calmed? After all, as someone very wise put on a t-shirt I once saw: Honesty is better than sugar coated bull$h!t.